Maddie Poppe sings “If It Makes You Happy” as her Birth Year song on American Idol Season 16 Top 7 Live Shows on Sunday, May 6, 2018. “It is amazing to watch you. You could anybody. You are owning yourself. Yo have a future in this business,” said Lionel. “It’s so exciting to see you play like a girl. You are a true artists and it makes me excited to witness you,” said Katy Perry. “You just shown us so many things,” said Luke. To vote for Maddie, text 10 to 21523 or vote using the official American Idol Voting App. The Top 7 will be trimmed down to Top 5 before hitting the stage for the next Live Shows next week. American Idol is an American singing competition television series created by Simon Fuller. It airs on Fox from 2002 and ended with it 15th season in 2016. On March 11, 2018, the 16th season will make its debut on ABC. The American Idol winner is determined by television viewers through public voting. The winner will receive cash prize and a record deal with Big Machine Records. 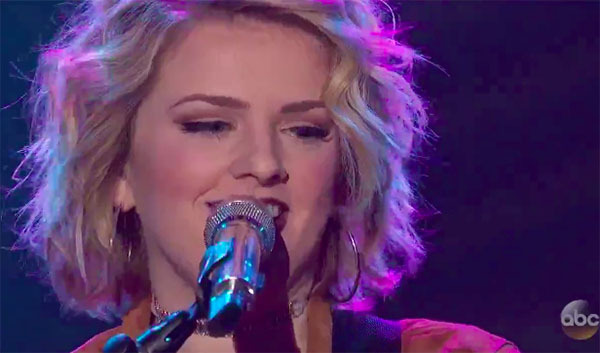 What can you say about Maddie Poppe’s performance? Share your comments on the discussion box below.